Back when I first started exploring manga, about 5 years ago, I often brought up Astroboy. The landmark 80s cartoon was my first experience with anime or manga and while most boys around me at the time talked about it like it was the best thing on TV (even better than Alf? Come on. ), I wasn't sold on it. If I wasn't thrilled with the storytelling, I despised the animation style. Was Astroboy supposed to have feet or not? Why did everyone have an oval mouth? 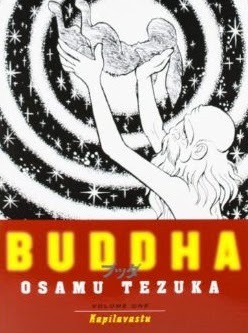 Now I find myself reading the first volume of Buddha, the award winning and now classic manga series that tells the life story of Gautama Buddha (the founder of Buddhism), and finding a new appreciation for the work of Astroboy and Buddha creator, Osamu Tezuka. Apparently Tezuka was heavily influenced by Disney, even writing a manga version of Bambi at one point, and this is quite evident in Buddha. While backdrops occasionally have more realism, the characters tend to be very cartoony. Combined with a slapstick, and sometimes vulgar sense of humour, it's probably not what one would expect for a book with religious themes. But it all works. I think Tezuka was right to take some of the "serious" edge off. It was very entertaining but only deceivingly light. Life is messy and funny sometimes. The more grandiose themes are still there and personally, I don't feel they are cheapened one iota. This is what I wanted and had expected from Robert Crumb's The Book of Genesis, but didn't get.